This weekend brings us the return of the famous LeonidMeteor Shower, a meteor display that in recent years has brought greatanticipation and excitement to skywatchers around the world. While theLeonids have been spectacular in years past, this year a modest display isexpected. Solely from the standpoint of viewing circumstances, thiswill be a favorable year to look for these meteors, since the Moon will be atfirst quarter phase and will have set in the West long before the constellationLeo (from where the meteors get their name) has climbed high in the sky. The Leonid meteors are debris shed into space by theTempel-Tuttle comet, which swings through the inner solar system at intervalsof 33.25 years. With each visit the comet leaves behind a trail of dust inits wake. Lots of the comet?s old dusty trails litter the mid-November part ofEarth?s orbit and the Earth glides through this debris zone every year. Occasionallywe?ll pass directly through an unusually concentrated dust trail, or filament,which can spark a meteor storm resulting in thousands of meteors per hour. That?swhat happened in 1999, 2001and 2002,because Tempel-Tuttle had through the inner solar system in 1998. But now, the comet – and its dense trails of dust – have allreceded far beyond Earth?s orbit and back into the outer regions of the solarsystem. So this year there there is little if any chance of heightenedactivity. In the 2007 Observer?s Handbook of the Royal AstronomicalSociety of Canada, meteor experts Margaret Campbell-Brown and Peter Brownindicate that this year?s peak activity should occur on the night of Nov.17-18. They cite 4:00 GMT on Nov. 18, which corresponds to 11 p.m. EST and 8p.m. PST on the evening of Nov. 17. This is the moment when the Earth will be passing closest tothe orbit of the long-departed comet, and when our planet seemingly is mostlikely to encounter some residual comet material. This time is highly favorablefor those in Europe and Africa. But in contrast for North American observers,Leo will still be below the horizon; they will have to wait until later in thenight to catch a view of the Leonids. 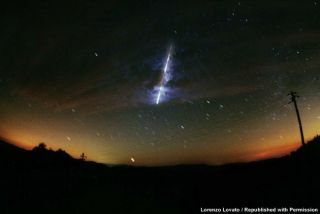 But while Leonid rates are unpredictable, it is unlikelythat more than about 15 meteorsper hour will be seen this year. Other meteor researchers concur that Leonid activity will bemodest at best. In the 2007 Astronomical Calendar, British meteorastronomer, Alastair McBeath also cites the night of Nov. 17-18 as the bestnight for Leonid viewing: "This year may see a return to more typicalmeteor numbers, perhaps 15+?" McBeath gives 3:00 GMT on Nov. 18 for this year's Leonidpeak and states that observing conditions "should be impressive forcovering this likely maximum, especially from Europe, North Africa and the Near East." Possible Brief Outburst over Asia? Other meteor researchers, however,such as NASA's Peter Jenniskens, Jeremie Vaubaillon of France, Esko Lyytinen of Finland, David Asher of Ireland and Mikhail Maslov of Russia, have examined Leonid prospects for this year and also suggest watching for somemeteor activity also on Nov. 18, but much later in the day. For instance: sometime between22:36 and 23:03 GMT, the Earth might interact with material that was shed bycomet Tempel-Tuttle back in the year 1932. But even in this case, the intensityof the shower will fall far short of the memorable Leonid displays thatoccurred as we transitioned from the 20th to the 21st century. "Unfortunately it isn'tpossible to have a 'once in a lifetime' chance every year," Asher notes. It is possible the dusty materialfrom 1932 will create a brief bevy of 30 to 60 Leonids per hour. But the timeframe when these meteors are predicted to be most numerous only favorsobservers in central and eastern Asia (where it will be the early morning hoursof November 19). And unfortunately, for Japan and Australia, the sun will havealready risen! The meteors will appear to emanate from out of the so-called?Sickle? of Leo, but prospective viewers should not concentrate on that area ofthe sky around Leo, but rather keep their eyes moving around to different partsof the sky. BecauseLeo does not start coming fully into view until the after midnight hours, thatwould be the best time to concentrate on looking for the Leonid meteors. The hoursafter midnight are generally best for watching for ?shooting stars? anyway,because before midnight we are riding on the back side of the Earth in itsorbit around the sun, whereas after midnight we are on the front or advancingside. After midnight the only meteoroids escaping collision are those aheadof the Earth and moving in the same direction with velocities exceeding 18.5miles (29.8 kilometers) per second. All others we will either overtake or meethead-on. But before midnight, when we are on the backside, the only meteoroidswe encounter are those with velocities high enough to overtake the Earth. Therefore,on the average, morning meteors appear brighter and faster than those we see inthe evening. And because the Leonids are moving along in their orbitaround the sun in a direction opposite to that of Earth, they slaminto our atmosphere nearly head-on, resulting in the fastest meteorvelocities possible: 45 miles (72 kilometers) per second. Such speeds tend toproduce bright meteors, which leave long-lasting streaks or trains in theirwake.